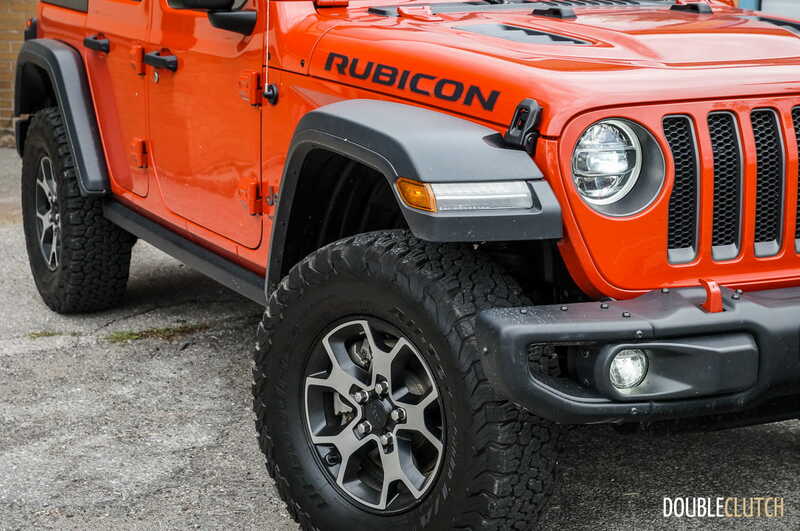 As the most adept on the trails, the Rubicon is, as expected, the priciest of the bunch. 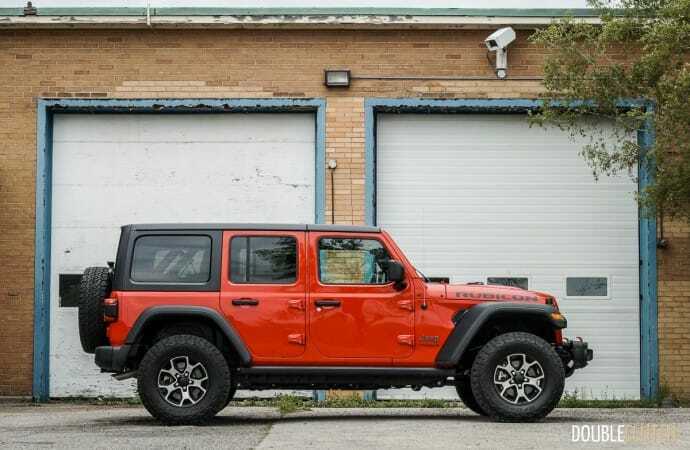 For those with a rough and tumble attitude who wish to be able to go anywhere where there may or may not be roads, Jeep has a good thing going with rugged, aggressively styled choices that have a decades-old cult following. 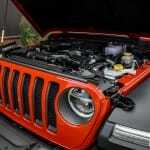 Ever since the old Willys Jeep used in military pursuits, they’ve been a staple of car culture. 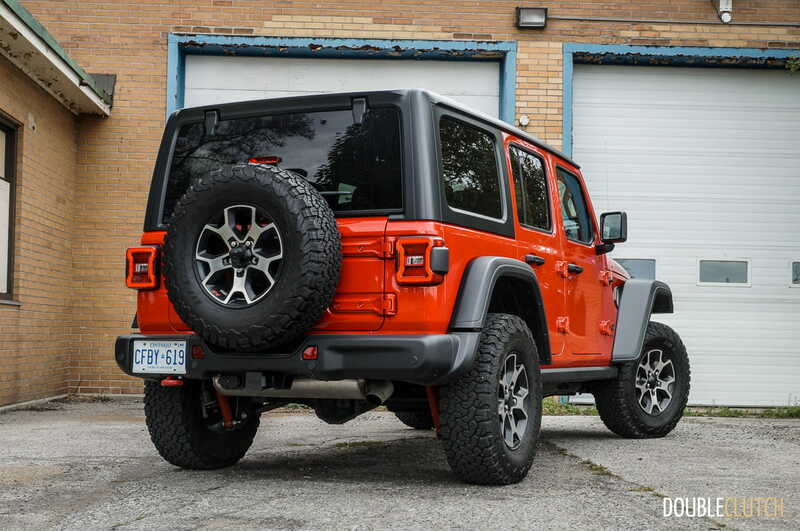 The 2018 Jeep Wrangler Unlimited Rubicon 4X4 is all-new for this year, and the new “JL” version is the latest effort at the Wrangler Unlimited’s most off-road capable version out of the box. 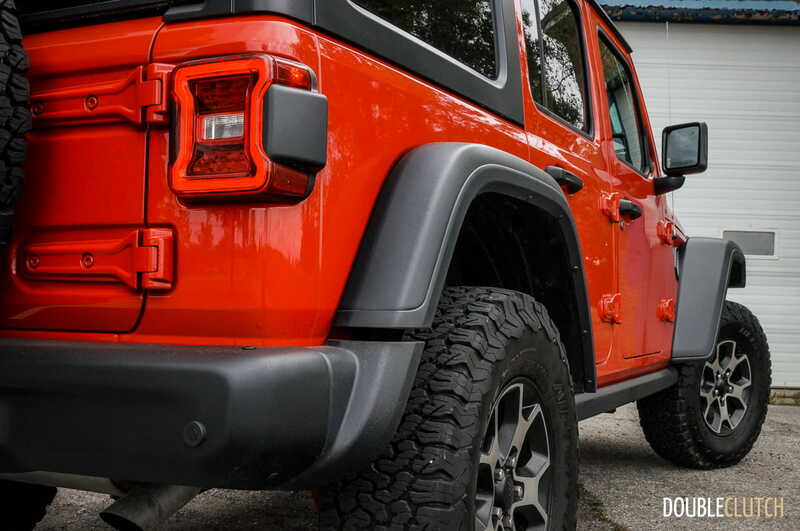 With a Firecracker Red example on test for a week, it was time to see what it was all about and also how it compares to the previously reviewed Sahara trim (reviewed here). 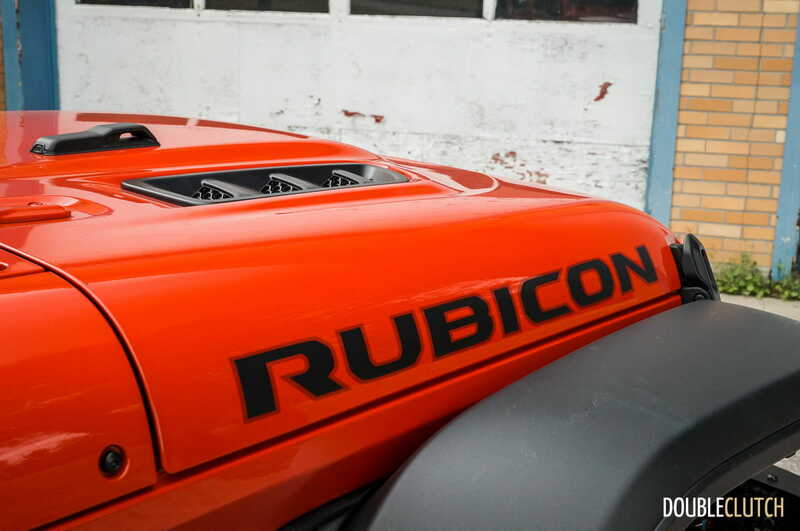 As the most adept on the trails, the Rubicon is, as expected, the priciest of the bunch. Starting at a base price of $49,745, the Rubicon gets more premium cloth seats, an accent-colour grille, black fender flares, red tow hooks, a black Sunrider soft top, automatic climate control, power heated side mirrors, SiriusXM satellite radio, and automatic headlamps. 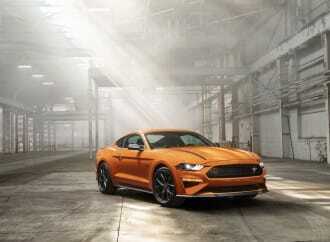 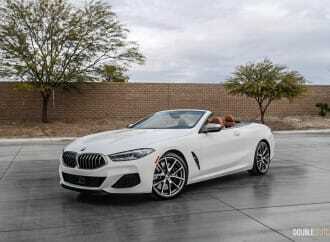 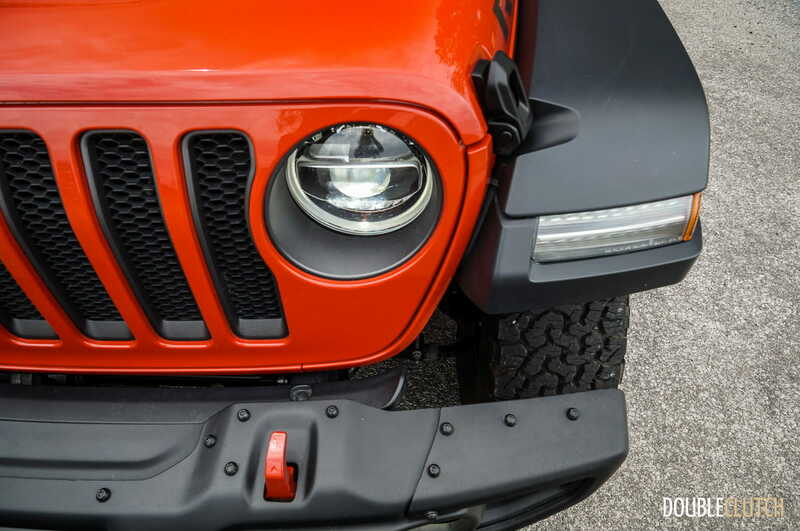 Options included $895 for the LED Lighting Group, which added LED taillamps, headlamps, and fog lamps, as well as LED accents for the daytime running lamps. 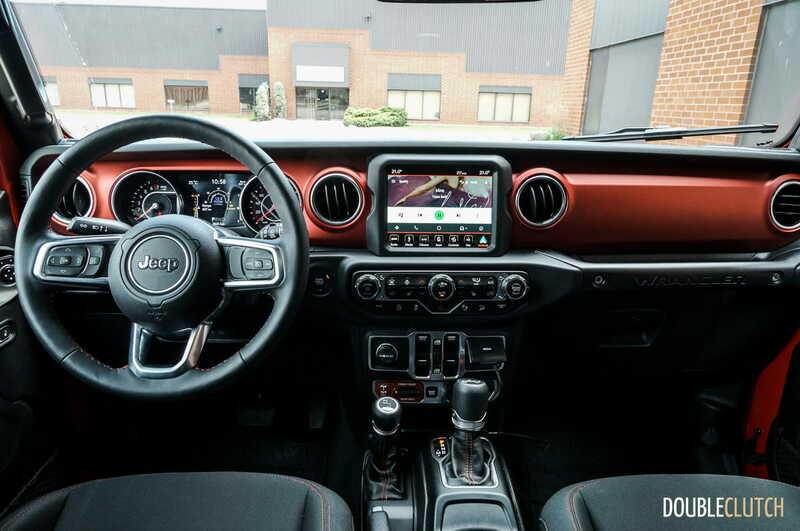 UConnect 4C (Navigation & Sound Group) was $1,395, and added an auto-dimming rearview mirror, Alpine premium audio, and UConnect 8.4 with navigation. 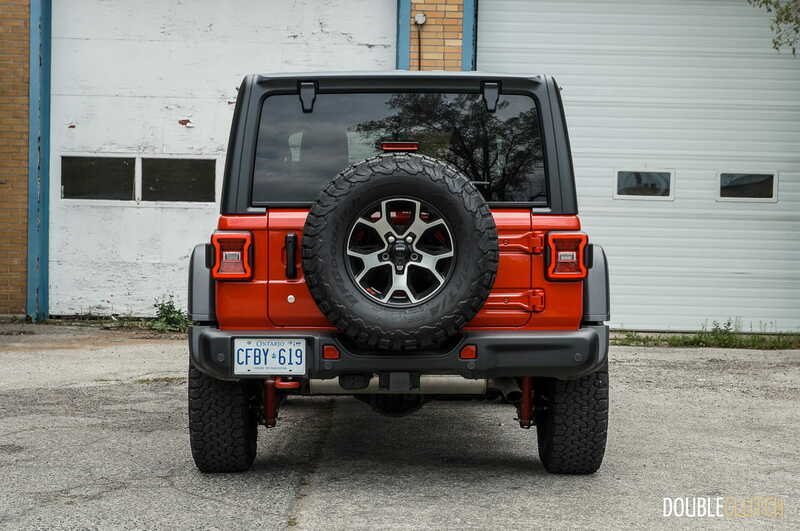 The SafetyTec Group was $845 and added rear parking sensors and blind spot monitoring. 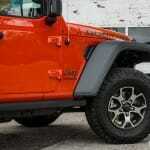 A steel front and rear bumper was $1,295, eight-speed automatic was $1,595, and a Freedom Top hardtop was $1,195. 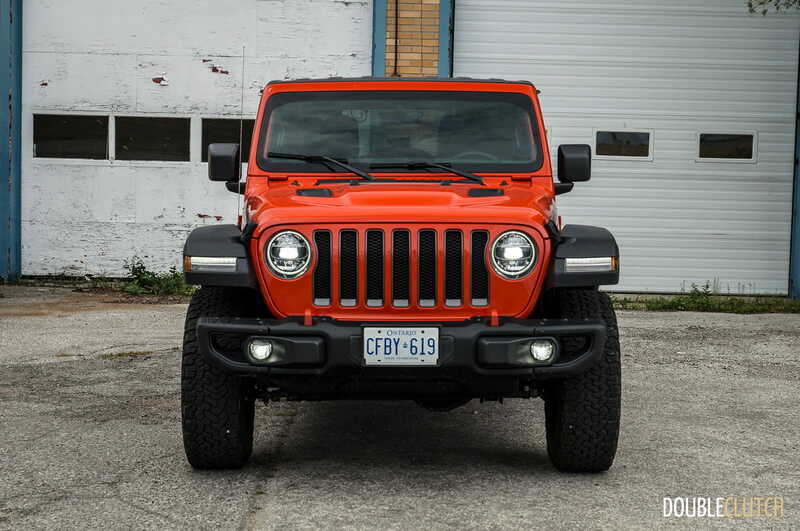 Among other things, the total as-tested price ballooned to $59,650. 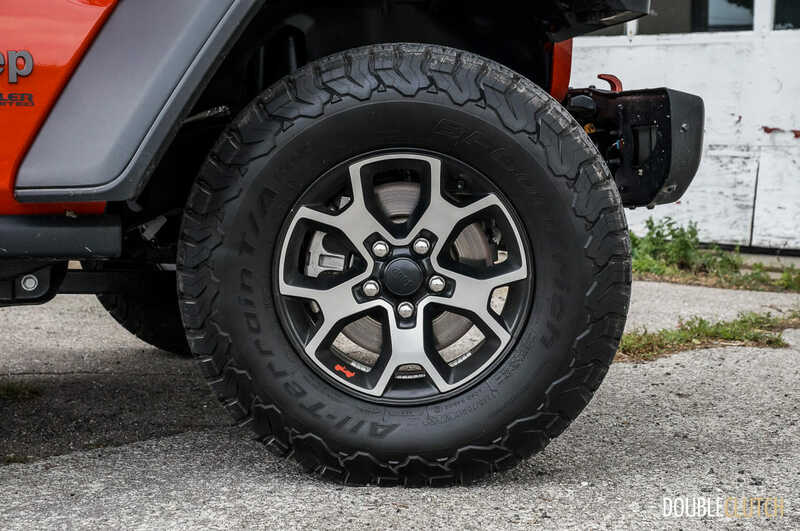 In terms of off-road goodies, things start off with a Rock-Trac heavy duty 4X4 transfer case with 4:1 low range, Dana M210 wide front and rear axles, front electronically-disconnecting stabilizer bar, a 4.10 rear axle ratio, and snazzy 17-inch alloy wheels wrapped in fan-favourite LT285/70R17 BFGoodrich All-Terrain T/A KO2 tires. 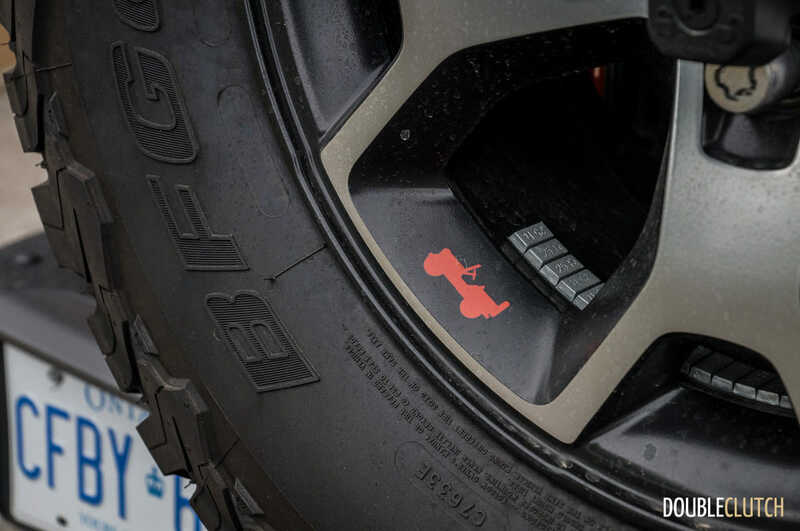 In all trims, there are also skid plates for the fuel tank, transmission, and transfer case, as well as weather-proof pushbutton start. 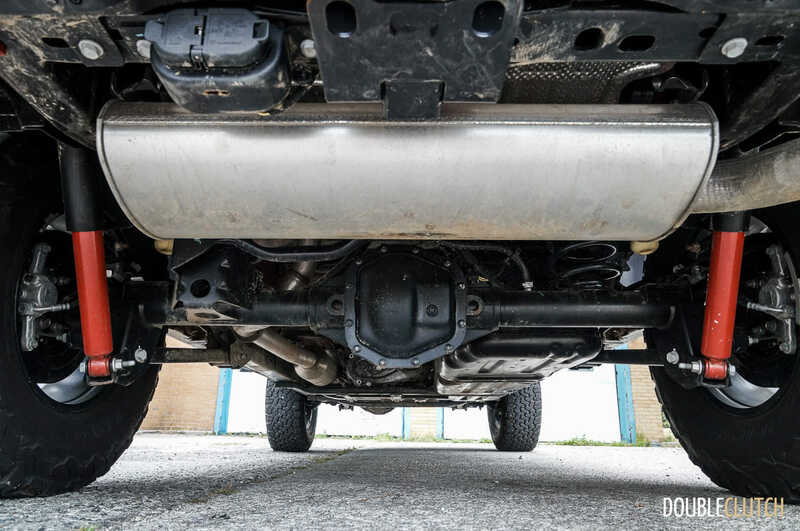 The transfer case can be locked for 50:50 power transfer front and rear, and the rear differential can also be locked for when the going gets really tough. 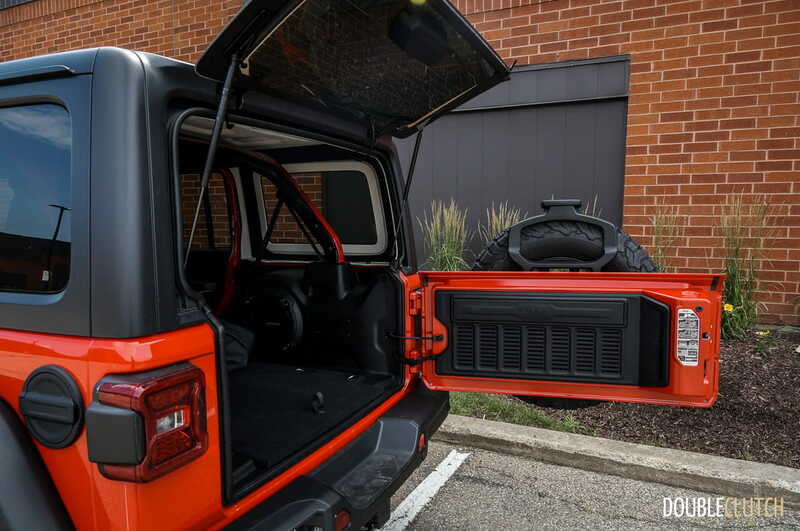 For those who want to live with the JL Wrangler Unlimited on a daily basis, they’ll find that it’s reasonably practical on the inside too. 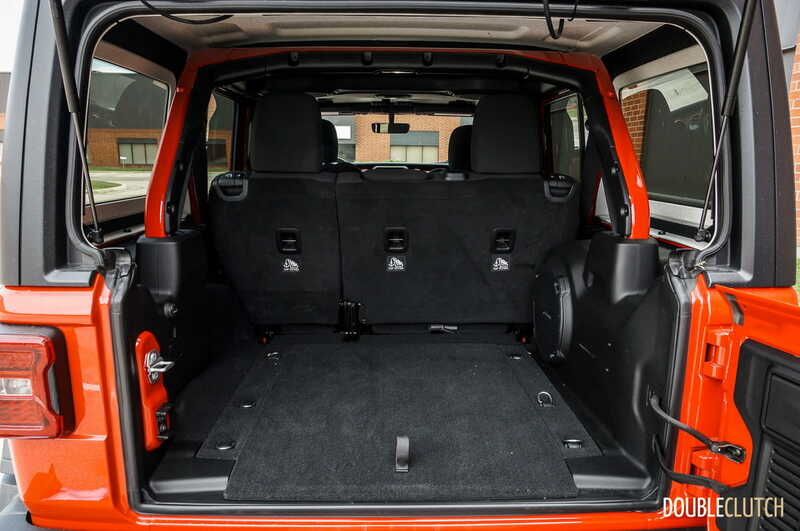 With 898 litres (31.7 cubic feet) and 2,050 litres (72.4 cubic feet), it competes with all of the more boring compact crossover SUVs, which isn’t too bad considering the space needed for the rugged body-on-frame construction. 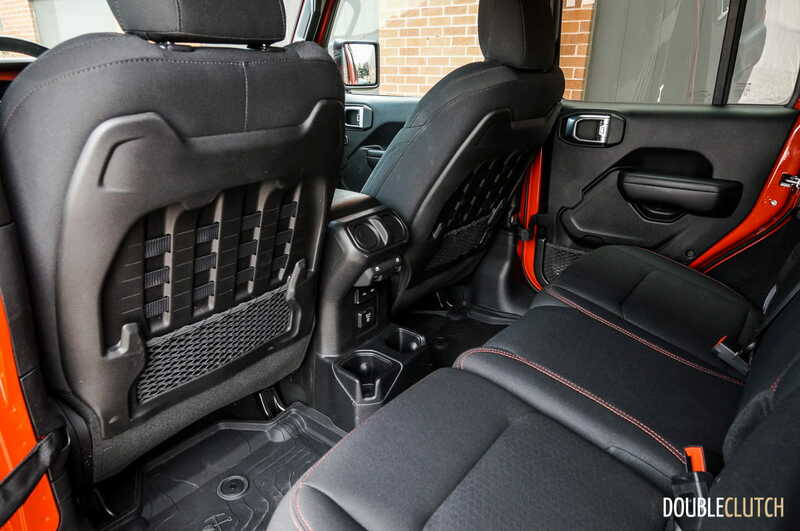 Rear seat legroom is generous, and the front isn’t too shabby, either. 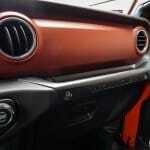 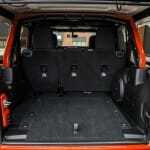 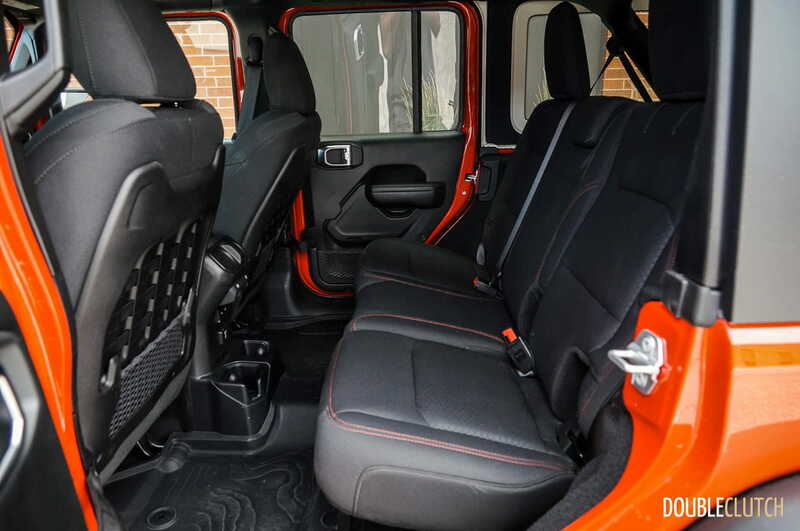 Seat comfort hovers around average, but is definitely a step up from the previous-generation JK model. 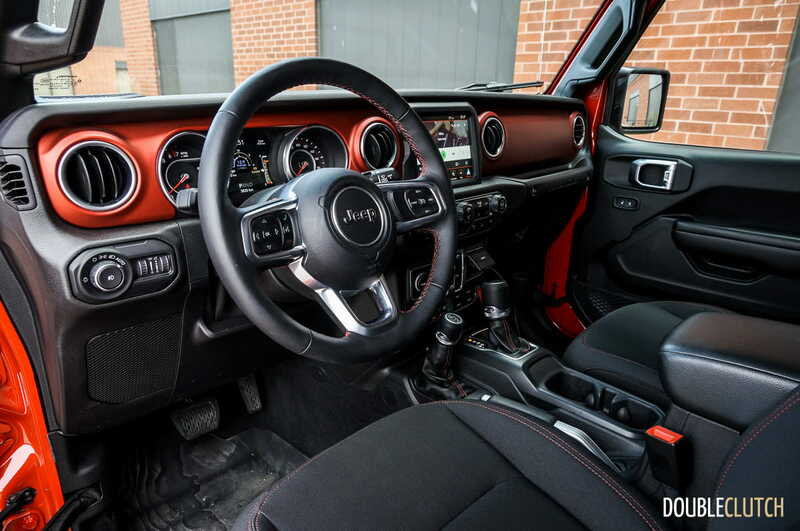 In terms of design and ergonomics, the interior is much improved, with higher quality materials and a layout brings the Wrangler out of the 1990s. 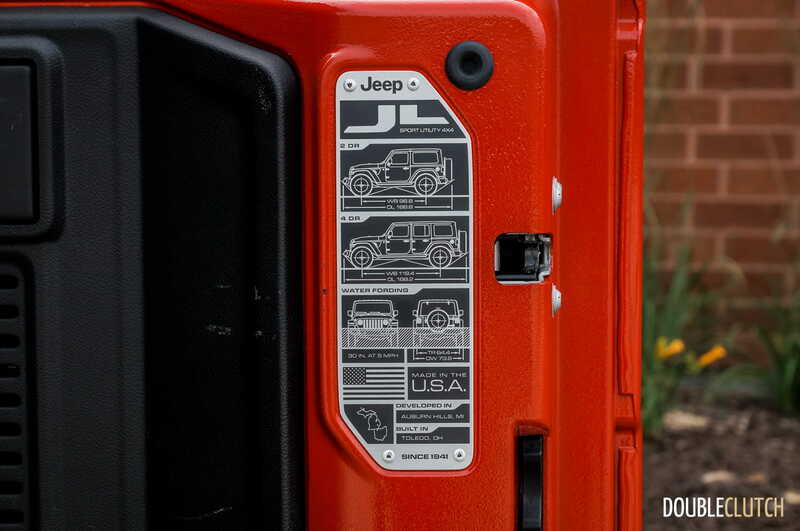 The four auxiliary switches near the shifter are a welcome touch, and are pre-wired for future additions such as lights, winches, or other accessories. 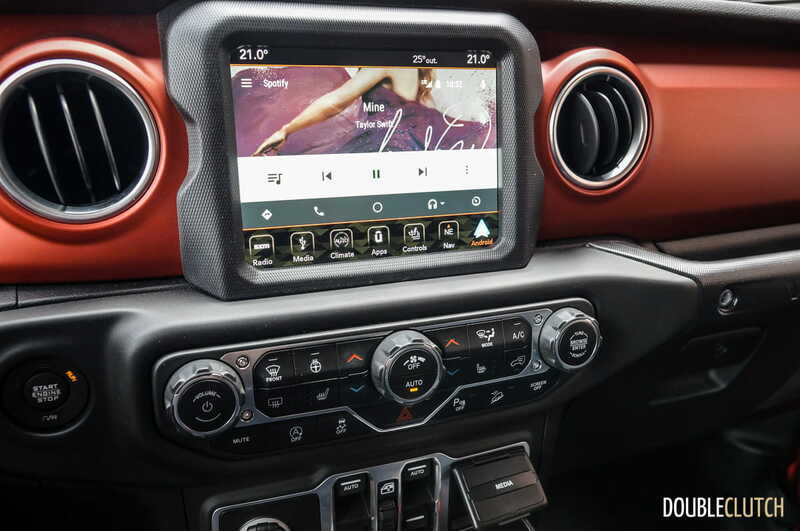 On the tamer Sahara and wilder Rubicon trims, UConnect infotainment brings Android Auto and Apple CarPlay to the table, which greatly improve upon last year’s Spartan interface. 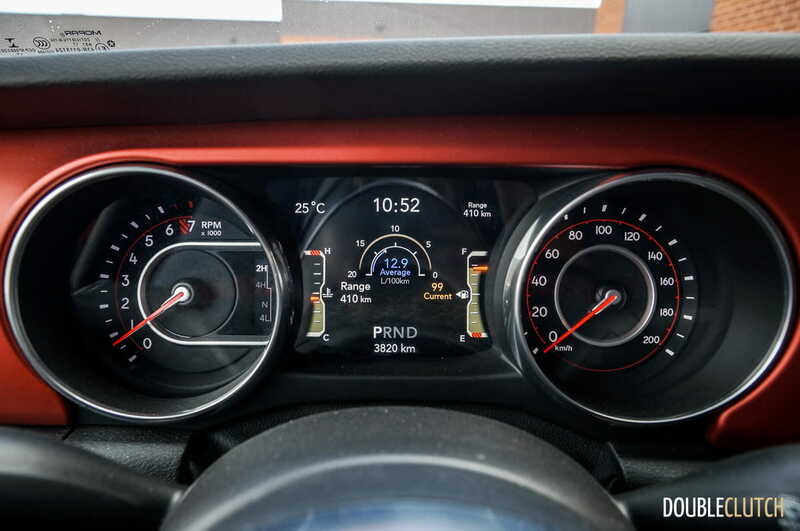 The UConnect vehicle menu underneath the smartphone interface does clutter the experience, however, unlike other cars where Android and Apple connections use up the whole screen. 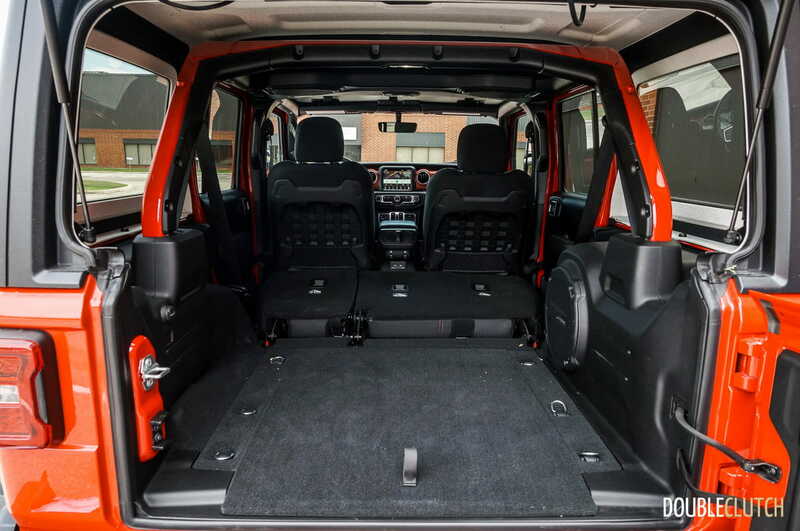 The Alpine audio is very heavy on the bass thanks to a rear cargo area mounted subwoofer, but lacks clarity and doesn’t compete as a premium audio setup. 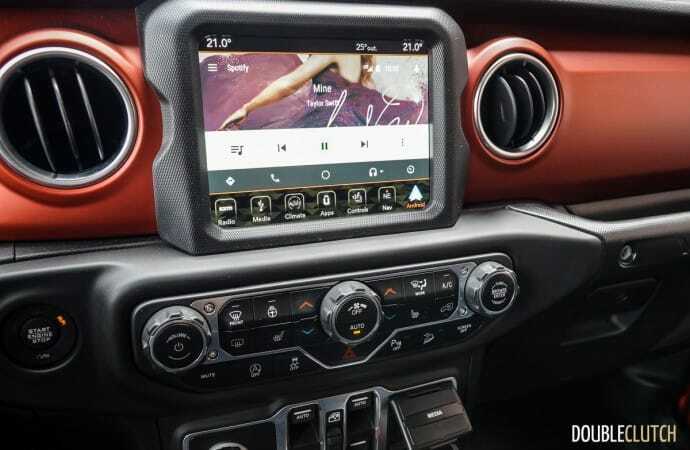 It comes as a package deal with the UConnect 4C with 8.4-inch screen and navigation, so buyers will be stuck with it in this case. 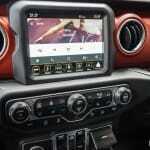 It’s also available as a $695 standalone option that should be skipped. 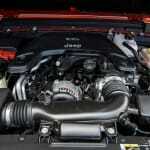 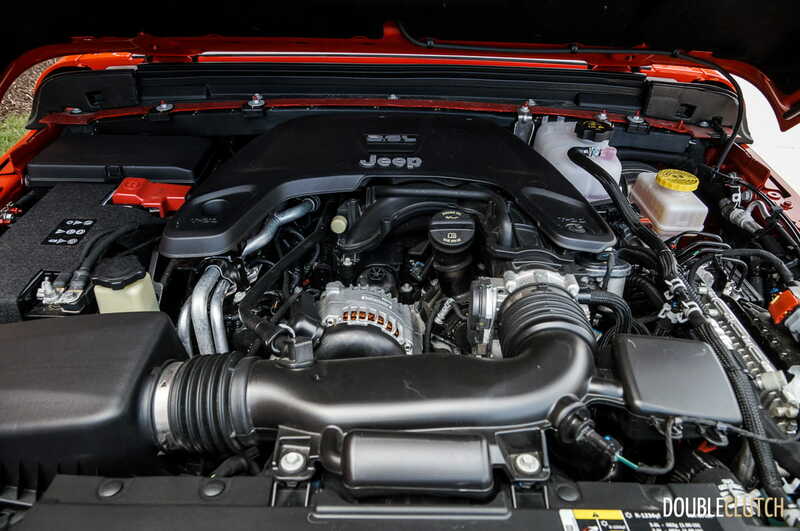 Powering all trim levels of the JL Rubicon is Chrysler’s 3.6-litre Pentastar V6 engine. 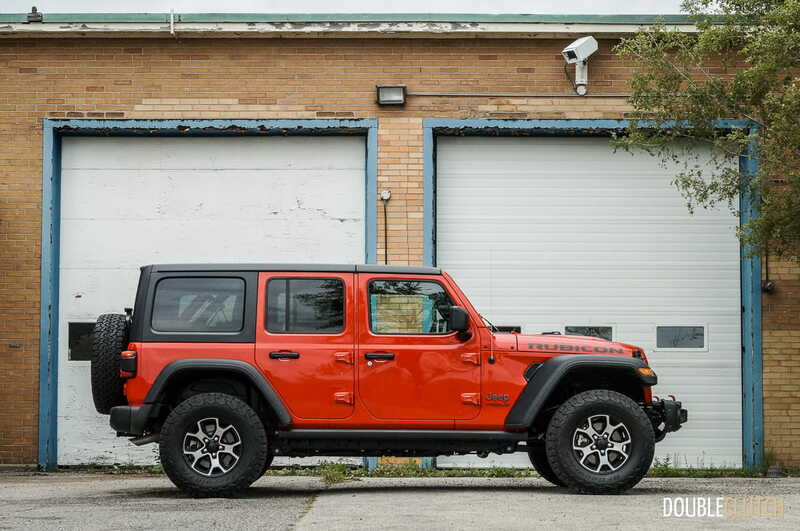 It’s a smooth operating engine with a not-so-smooth sound, and isn’t a big departure from the JK at all. With 285 horsepower and 260 lb-ft on tap, one of the major complaints on the outgoing JK was the lack of low-end torque. 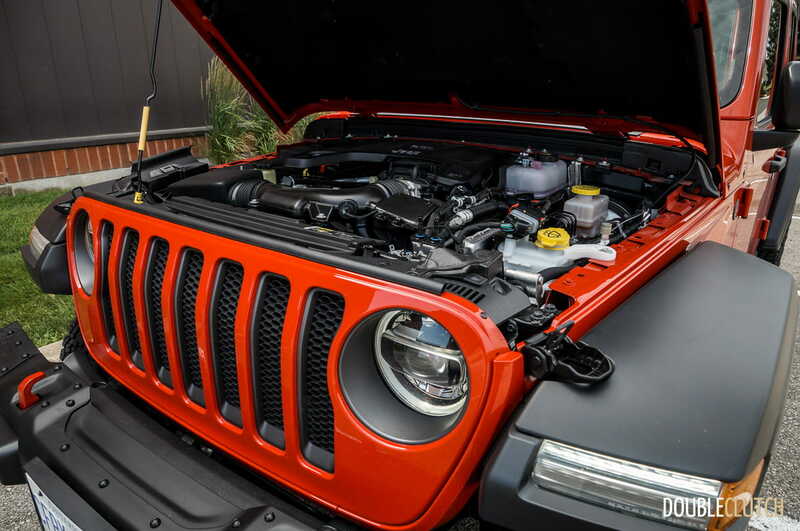 Once revved up past 3,500RPM, the Pentastar springs to life and pulls well to redline, but below that, there isn’t a whole lot going on. 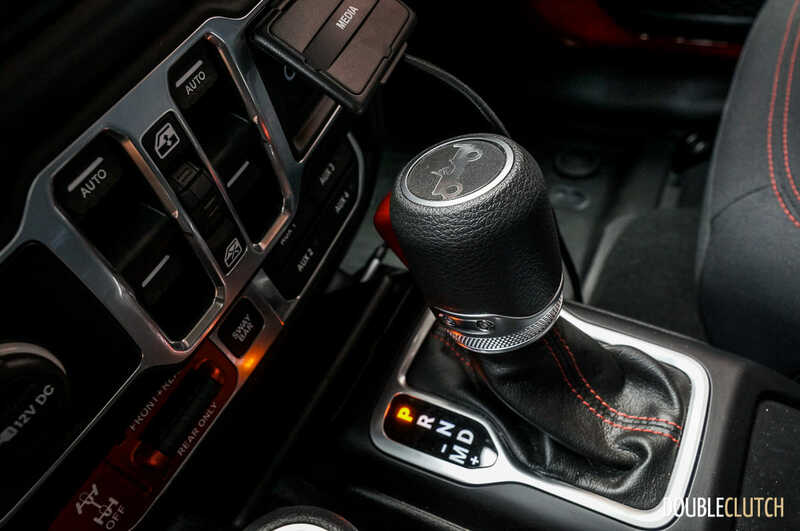 Thankfully, the addition of an eight-speed automatic – already in use in cars like the Jeep Grand Cherokee or Ram 1500 – solves much of the issue. 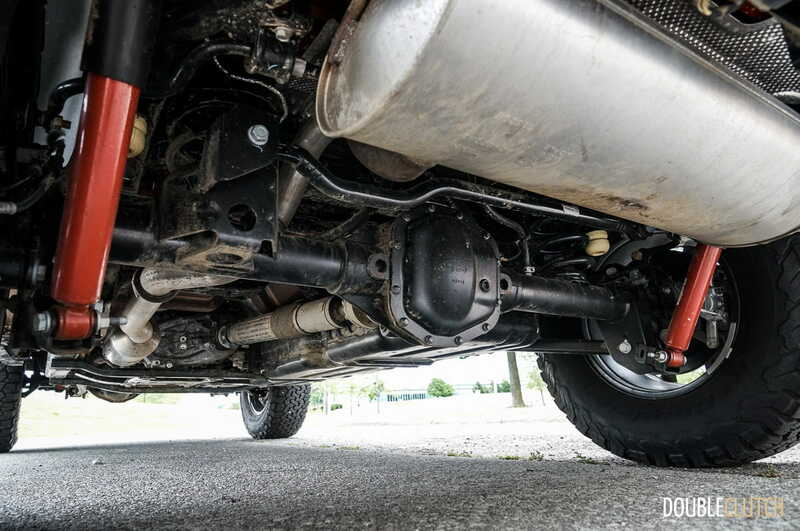 Closer ratios ensure that the engine spends more time in its sweet spot, despite the torque deficit still being present. 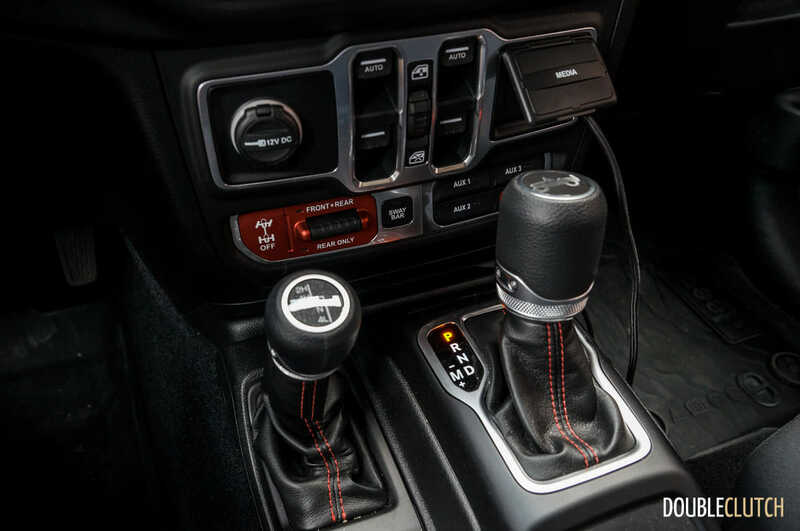 Shifts are fast and confident, which help a ton when it comes to driving in low-speed or stop-and-go situations. 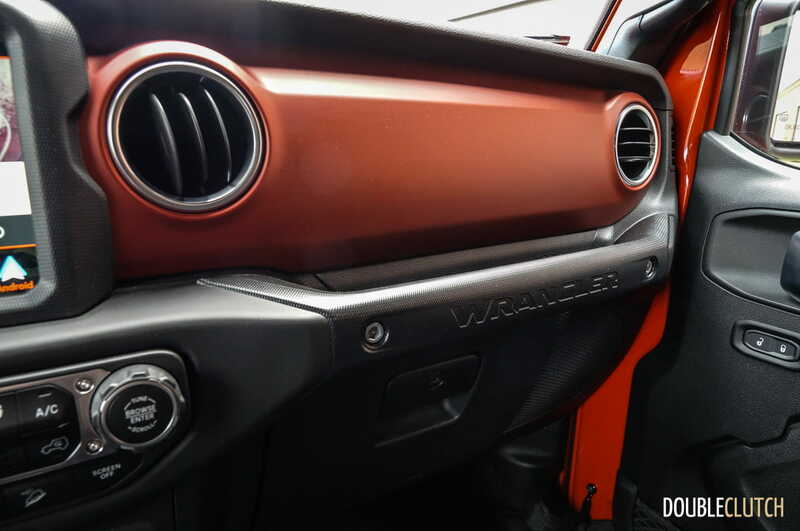 Fuel economy for the automatic and V6-equipped Wrangler Unlimited comes in at 12.9L/100KM in the city and 10.2L/100KM on the highway. Observed economy after a week of mixed driving missed the mark at 13.0L/100KM, but this is likely due to extra weight carried by the Rubicon, the knobby all-terrain tires, as well as the shorter 4.10 rear axle ratio keeping revs higher in both city and highway driving. 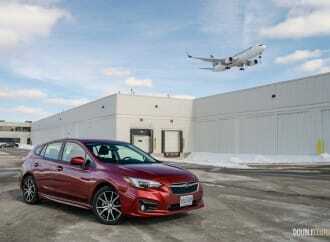 The poorer economy was observed despite the addition of start/stop technology. 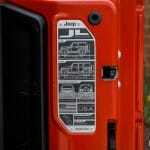 Fuel tank capacity is 81 litres, and regular 87 octane is acceptable. 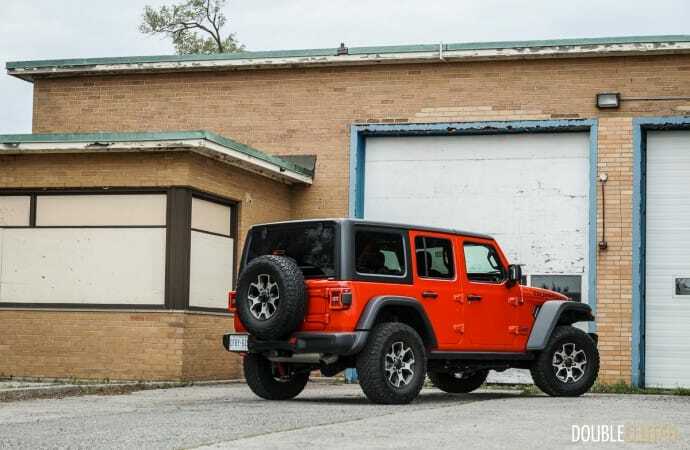 While there wasn’t quite enough opportunity to tackle tough trails during the Rubicon’s week of testing, it’s definitely a machine that commands respect, and can handle tough terrain that require modifications and changes if driving older generations of Wrangler. 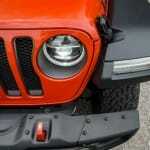 The steel front bumper easily accepts a winch, and as always, all doors are removable. 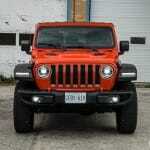 The front windshield can still fold forward, but has been redesigned so that it can be laid flat much more quickly. 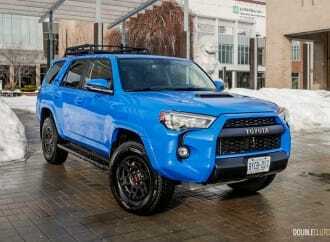 The side effect to this, unfortunately, is that the frame around the windshield remains. 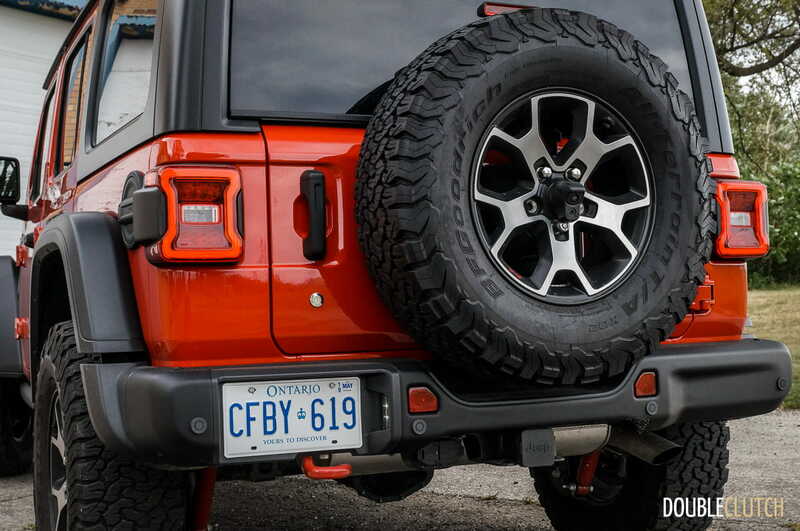 For those who want to tow, up to 1,588 kilograms (3,500 pounds) can be slung behind the Wrangler Unlimited. 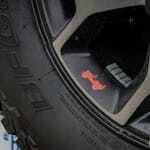 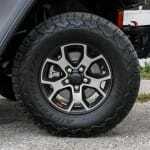 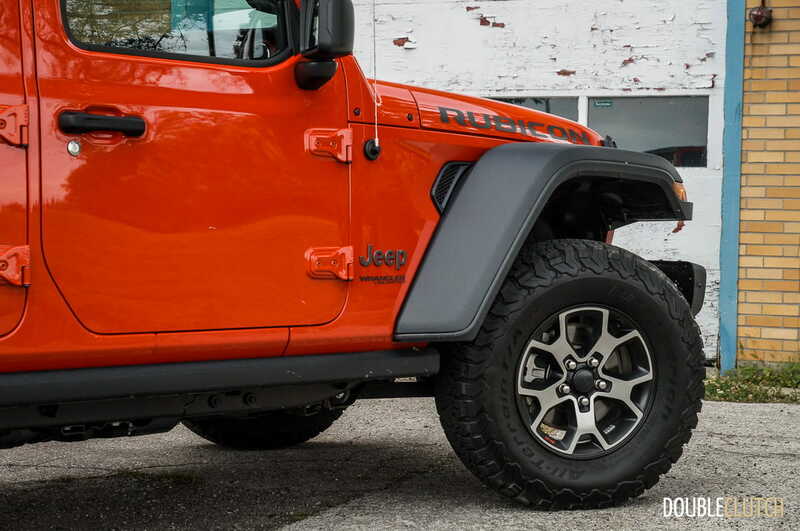 On pavement, the Wrangler Unlimited Rubicon made all its extra equipment known relative to more sedate versions. 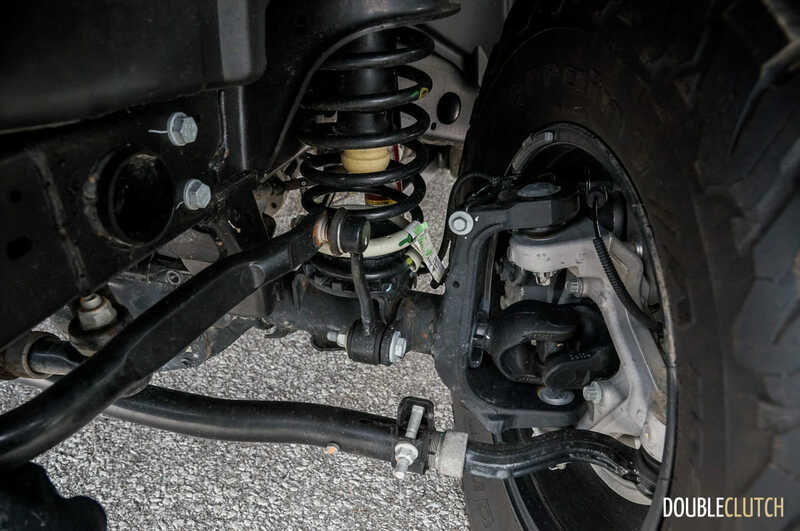 Ride quality on the highway is smooth enough, but expansion joints and potholes still send jitters through the frame and body. 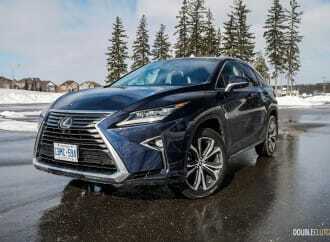 Higher speed stability is not a strong suit with the extra ride height, knobby tires, and off-road tuned suspension bits – getting over 110 kilometres per hour can sometimes feel dicey if crosswinds or uneven pavement is present. 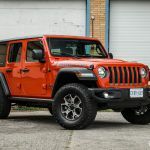 By comparison, the Sahara is much more suited to on-road driving, for those who want their Wrangler to be a pavement princess – enough such that comparisons to the lower-equipped Grand Cherokee V6 models come to mind. 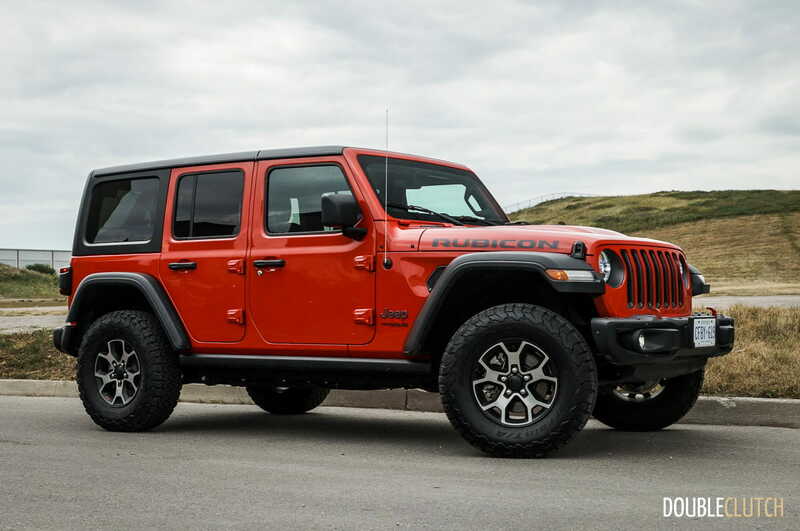 As the sum of its parts, the 2018 Jeep Wrangler Unlimited Rubicon 4×4 is the most advanced Wrangler ever, and reminds you of this every time with bold styling with unmistakable Jeep cues with various nameplates and logo insignia throughout. 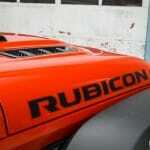 While pricing has crept up, so has refinement and capability, as well as safety. 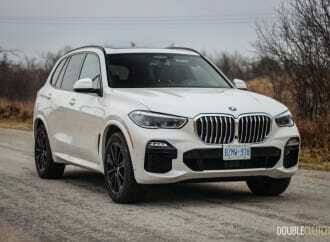 Reinforcements to the entire structure, as well as additions like blind spot monitoring and a rear-view camera make for a better family vehicle for when the young ones come along. 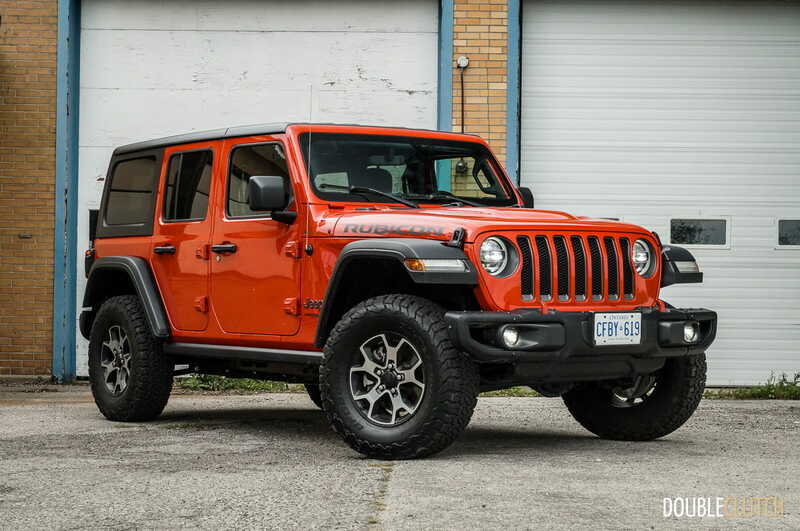 While the Rubicon does sacrifice on-road manners in favour of off-road prowess, it’s still built upon the most civilized, yet most capable platform underpinning the Wrangler name.